In his 16th year in the NBA and first season with the Los Angeles Lakers, LeBron James has Michael Jordan's career points haul in his sights. James has already established himself as one of the all-time greats and could surpass the six-time NBA champion in scoring this year, though Dirk Nowitzki is first up on his list of potential targets. Stephen Curry can move past a number of names with his prowess from beyond the arc, while a major milestone is also in the offing for Chris Paul. With the help of Opta, we take a look at the landmarks approaching for some of the league's biggest names. - James is just 382 points away from passing Wilt Chamberlain (31,419) in fifth on the NBA's all-time points leaderboard. - James enters the campaign averaging 2,069.2 points per season. If he reaches that total again, he will surpass Michael Jordan (32,292) for fourth on the chart. - Nowitzki is also chasing down Chamberlain's points total. The veteran German will move beyond him if he scores 233 points this season. - Curry is averaging 236.6 made three-pointers per season in his career. If he hits that total in 2018-19, he could jump to as high as third in the league's all-time three-pointers made list. 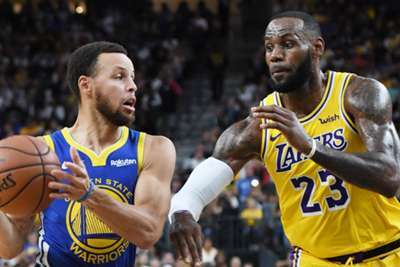 - To go third Curry (2,129) would need to surpass Jason Terry (2,282) and Kyle Korver (2,213), who could join Ray Allen (2,973) and Reggie Miller (2,560) as the only players with more than 2,300 three-pointers made. The @Lakers defeat the @warriors 123-113 in Las Vegas! - Paul needs 292 assists to become the eighth player in history with 9,000. He enters the season averaging 669.8 assists per year and if he reaches that total he would move up to seventh from ninth on the all-time leaderboard. - James has averaged 547.2 assists per season in his career and needs 317 to pass Andre Miller for the 10th most in NBA history. - This will be Nowitzki's 21st year with the Dallas Mavericks, breaking a tie with Kobe Bryant (Los Angeles Lakers) for the most seasons with a single team. 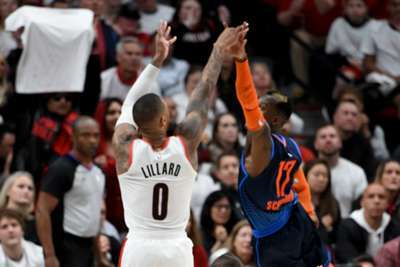 Dennis Schroder's antics in Game 3 riled Damian Lillard, who got revenge over the Oklahoma City Thunder in the NBA playoffs on Tuesday.